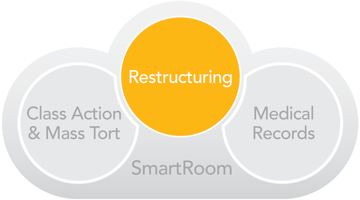 The restructuring process is inherently uncertain. Companies encountering these uncertain times trust a myriad of professionals to navigate the process - attorneys, bankers, funds, financial advisors, industry specialists, functional specialists, accounting, tax and administrative support, all work in concert towards a successful outcome. Secure, shared, accurate, and up to date information is essential to all parties involved in the process. SmartRoom's secure, cloud-based platform allows key players to securely share documents, collaborate and streamline workflows. The confidentiality level and sheer volume of data shared between the company, professionals and key constituents can be considerable. Regardless of the corporate event, sensitive internal documents and data are shared among multiple parties.